Not only the most creatively adorned store, but there is the cutest man in the world there-really, girls' comments, not mine-Go towards the back or go in the back store: He's 6'5, black hair, hazel eyes, a hair style to die for-by the way ladies, he has a million dollar smile: check it out; and don't complain about what they are selective about: that's what makes the store great, the James' st. one is small and WOW is it ever creatively and beautifully adorned! Last week, I was in Bellingham for a quick jaunt from Vancouver, BC. After going to Trader Joe's, I went into the Label's store and was really pleased with the quality of clothing, assortment, prices, cleanliness and atmosphere. The lady at the check-out was friendly and polite. Highly recommend this store and I will be back. Thank you. I live in Port Coquitlam BC Canada and whenever I drive down to the States I always drop into this store. I have never left empty handed. I come in open minded, never really looking for anything in particular. For me, that is the best way to consignment shop. Too bad our dollar has tanked as I am going through 'Labels withdrawal' 🙂 I miss my favourite store. I had an unfortunate experience at Labels and posted my dissatisfaction on this website. The owner, Sage contacted me immediately and went above and beyond to get to the bottom of the problem and stayed in touch until it was resolved. WOW, one doesn't see that happen in Big Box stores! Ok so the all girl annual shopping trip and they decided to go to the mall. I found NOTHING! We all said our goodbyes and I headed straight for Labels. I found 1/2 a wardrobe that night 🙂 YOur stores are always clean, spacious dressing rooms and enough that you do not have to wait very long if at all. The staff is always helpful in picking pieces or pushing you to try something fabulous that you are just to shy to try ....you get it home and rock it. Thanks Labels for being creative, having great suggestions and for always being a great deal! I just wanted to share some happy and exciting thoughts with you. Recently, I bought a new car, and as a single female, I’ve set forth a bunch of different ways to save money in light of that new car payment. One of those initiatives included consigning and finding clothes through our business. 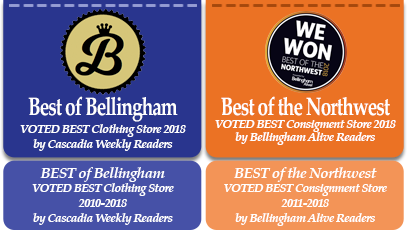 I’ve only lived in Bellingham for a year, and I had yet to visit either of your sites. I just wanted you to know what an incredible experience I had there. Thankfully, I’ve lost 60-plus pounds and kept it off for the last two years. It was thrilling for me to donate and consign three garbage bags full of size 14 and 16 clothing and that will serve as my commitment to never let myself become those sizes again. I also really hope those consigned clothes will help any other curvy women look and feel amazing! Additionally, your staff at the Northwest shop were so completely wonderful to work and chat with. They immediately made me feel welcome and quickly helped me understand your consignment process. Also, I was floored when I started checking out your inventory. I found such cute things that are right up my alley. You have no idea how happy I was to see your prices, especially in light of my new vehicle purchase! I’m so happy to say that I won’t need to go to department stores anymore, and I’m very grateful for your business and all that it has to offer. I can’t wait to go to your Ellis location! Thank you for all that you do for women and consignment!